1965 was a great year. The average cost of a new house was $13,600. Gas cost 31 cents a gallon. Pink Floyd was formed. The Rolling Stones released Vol.2, their second UK album. It was a great year for music, and a great year for the guitar too. 1963, 64 and 65 are my favorite years for Gibson acoustics. I love the necks, with a comfortable medium "C" profile and a great taper. I'm also a fan of the ceramic bridge saddle. The sound is amazing. Listen to the early Stones records, you will hear what I mean. We have a beautiful 1965 Gibson J-50 Adj. It's a super clean, one owner instrument. It has very light wear, like it was played a year, then put up. The natural finish shows very light lacquer checking. 1-11/16" nut width. The frets are fine with plenty of life in them. No repairs or modifications. It has no issues or problems. It's featherweight and sounds fantastic. This is a collector's grade instrument, there aren't that many this nice around. One of the best I've seen. Comes with original hardshell case. We have a serious banjo for the serious banjo player. We are offering a 1929 Gibson Mastertone banjo with a great five string neck conversion by Robin Smith. Robin Smith is one of the greatest banjo luthiers of the modern era and did a fantastic job with this one. It is a two piece flange with an archtop tone ring. The resonator is replaced and is signed by Doug Dillard (member of the Williams And Clark Expedition band) and Sammy Shelor (member of the Lonesome River Band). It is set up with a Kavanjo pickup that sounds great. It plays great, sounds great, and looks great. Comes with hard case. It's hard not to love Hawaiian music. Sol Hoopi was the absolute king of the lap steel, and played a pretty mean uke as well. The ukulele is such a vital component of great Hawaiian music. They were serious instruments for serious players. Here we have a 1950's Martin T1 Tenor Ukulele. No serial number. It is all mahogany with tortoise-celluloid binding. 1:1 friction pegs. C.F. Martin logo on the headstock. The neck measures 1-5/16" at the nut and has a 17" scale. In excellent condition, showing only minor cosmetic wear. It sounds great, as only a vintage Martin uke can. It is very collectible, and very cool. The Brazilian fingerboard and bridge are highly figured. No repairs and no issues. It is all original and ready to go. It comes with the original soft case, with an original Martin string price list, and some original Martin strings. 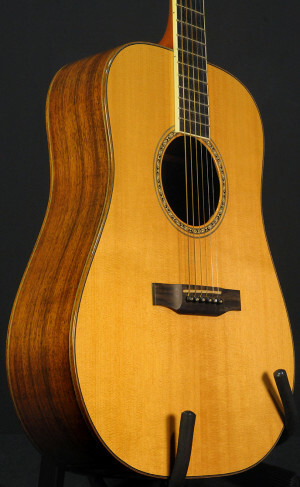 We are offering a 2005 Beardsell 2GW guitar. This is fantastic sounding guitar with a unique guitar design that would be well suited for Gypsy Jazz. 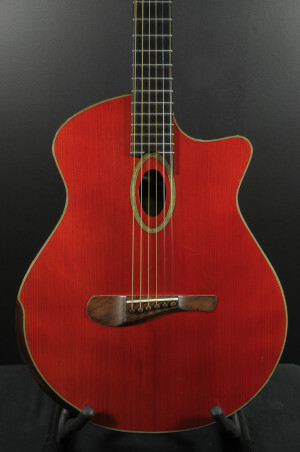 This is a visually stunning instrument with several unique features, most notably the soundholes in the side. The bracing is double X, on top and bottom. The workmanship is just impeccable. Beardsell is the on the cutting edge of guitar building. There is some very light pick wear, nothing major. It's ready to play. The finish is very lightly applied, in order to enhance the sound...and this guitar is extremely resonant and loud. Everything about this guitar is thoroughly thought out and and well executed. It is the ultimate Gypsy Jazz guitar. Comes with original hard case. This is my favorite guitar in the whole world. That's a pretty bold statement I know, but I'm in love with vintage Gibson J-45 guitars. I especially love tobacco sunburst, adjustable bridge J-45 guitars. Here we have a 1960 Gibson J-45 ADJ in tobacco sunburst, ceramic adjustable bridge with a newer, non-original chipboard case. Serial number #R5835-19. It's a one-owner guitar, and it's been played a lot. There is pickwear around the soundhole, and pickguard cracks. That's fairly standard for models from this era. The original owner put his initials with mailbox letter on the headstock and front of the guitar. They are small and unobtrusive, I would leave them there, It adds character and history in my humble opinion, but they can be removed. The neck has a 1-11/16" nut width. The bridge has a slight lift at the edges on the treble and bass sides...it hasn't moved in 30 years, so it should be fine for many more years to come. The overall condition is very good. Some nicks, dings and scratches, and some pick wear, as mentioned earlier. Action is a respectable .100" at the 12th frets of the low E string and .070" at the 12th fret of the high E string. This is a solid, well loved guitar that sounds like a million dollars. It's awesome, and I mean that from the bottom of my heart. To find a one-owner vintage guitar doesn't happen that often these days. The gentleman we got it from is 96, and he bought it new. That is so cool. *Reduced Price* Vintage 1950's Gibson Radio Tone Dobro 7 String SUPER RARE! I've been aware of this instrument since 1983 when I read an article in Guitar Player magazine by George Gruhn about a 7 string Dobro made by Gibson. I was quite intrigued, as I played Dobro a bit as well. It was a marvel to behold. Now for a little history: CMI was a conglomerate that from 1944 until the mid fifties, owned Gibson and the National Guitar Company. There was a bit of an incestuous relationship between the two companies. It was not uncommon for National to use Gibson bodies, and then use their own necks, hardware, etc. I've seen Gibson J-45 bodies and ES-175 bodies with National parts. The point of this is that there was some intermingling of the two companies. After WWII, National stopped making resonator instruments. However, there was still a demand from traditional Dobro players. Even back then they were searching the pawn shops for used instruments. That brings us back to our Gibson Dobro. It exists, and we have it in our shop. It was possibly a prototype made by Gibson with a vintage National/Dobro resonator. National had a stash of those, and used them in the sixties on some models. So, this guitar was either made as a special order, or as an experimental model. I tend to think it was made for a customer because most prototypes I've seen are somewhat crude - this is not. It is a finished instrument. It is seven strings with four resonator screens. The body is a Gibson Southern Jumbo guitar body. It's bigger than any traditional style Dobro that I've seen. Bigger body, bigger sound; that's how it works. So as just a musical instrument, it's the best sounding Dobro I've ever heard. It's the only one my friends. There is a rumor that two more were made, but it is unsubstantiated. This is about the rarest Gibson on the planet and that is including the elusive, never seen "MODERNE". I've never seen a Moderne in person, but I can look at this guitar anytime I want to. It's clean and nice, showing some light wear, but overall condition is excellent. It's really something. A piece of history - and it can be yours! Comes with vintage hard case. We are offering a 1959 Gibson LG-1. Now remember folks, this is a Memphis guitar. Elvis was from Memphis and Elvis played a Gibson LG-1. So, keep that in mind. This is really cool one, serial number S 820102. It's all original with single line Kluson tuners and sunburst finish. It sounds really good, and plays fine. The frets are original, and are in good shape. Overall condition is very good. There are numerous dings and scratches, but it has a great vintage vibe, and beautiful patina. 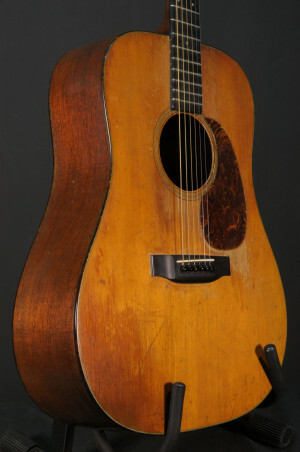 This is a vintage Gibson that will not break the bank, but will continue to rise in value. Comes with non original chipboard case.